Permanent Account Number (PAN) card, issued by the Income Tax Department, enables the taxman to track all your transactions. Permanent Account Number (PAN), the 10-digit alphanumeric number, helps the Income Tax Department maintain a record of all the financial transactions of an assessee. It is imperative to link the PAN card with all your bank accounts. Income tax returns (ITRs) cannot be filed without a PAN card. As the new financial year - 2018-19 - has just started, it might be significant for you to apply for and link all your financial transactions with your PAN card. 1. PAN was introduced to facilitate linking of various documents. These include payment of taxes, assessment, tax demand, tax arrears etc. relating to an assessee. The aim was to facilitate easy retrieval of information and to facilitate matching of information relating to investment, raising of loans and other business activities of taxpayers collected through various sources - internal as well as external - for detecting and combating tax evasion and widening of tax base, according to the I-T department. 2. It is mandatory to quote PAN on return of income and all correspondence with any income tax authority. 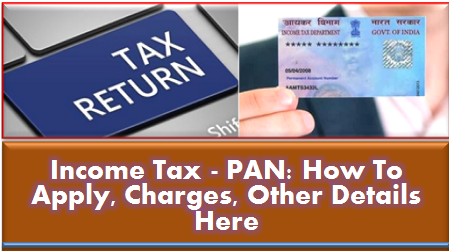 From January 1, 2005 it has become mandatory to quote PAN on challans for any payments due to Income Tax Department, according to its website - incometaxindia.gov.in. 3. PAN or Permanent Account Number is a ten-digit alphanumeric number. A typical PAN looks like this: AFZPK7190K. 4. By using the Online PAN Verification facility on the Income Tax Department's website, an individual can know/verify his or her PAN. This facility is referred to as "PAN Verification" or "Know Your PAN". 5. The Income Tax Department has an electronic portal for lodging PAN grievances through 'Aayakar Sampark Kendra' (Income Tax Communication Centre). According to the Income Tax Department , applications for fresh allotment of PAN can be made online. Requests for changes or correction in PAN data or request for reprint of PAN card (for an existing PAN) may also be made online. Online application can be made either through the portal of NSDL or portal of UTITSL, mentioned the I-T department on its website. UTIITSL or UTI Infrastructure Technology And Services Limited is a government-owned company that provides technology and outsourcing services to the financial and government sectors of India. NSDL or National Securities Depository Limited is the largest depository in the country. The charge for applying for PAN is Rs. 93 (excluding Goods and Services tax) for an Indian communication address and Rs. 864 (excluding Goods and Services tax) for a foreign communication address, according to the Income Tax Department's website. Payment of application fee can be made through credit/debit card, demand draft or net banking. Once the application and payment is accepted, the applicant is required to send supporting documents through courier/post to NSDL/UTITSL. Only after the receipt of the documents will the PAN application be processed by NSDL/UTITSL. Individuals can submit PAN applications at the PAN application centres as well.